I was procrastinating again last weekend and made this little wall arrangement for the Interior Styling flickr group's February Challenge. 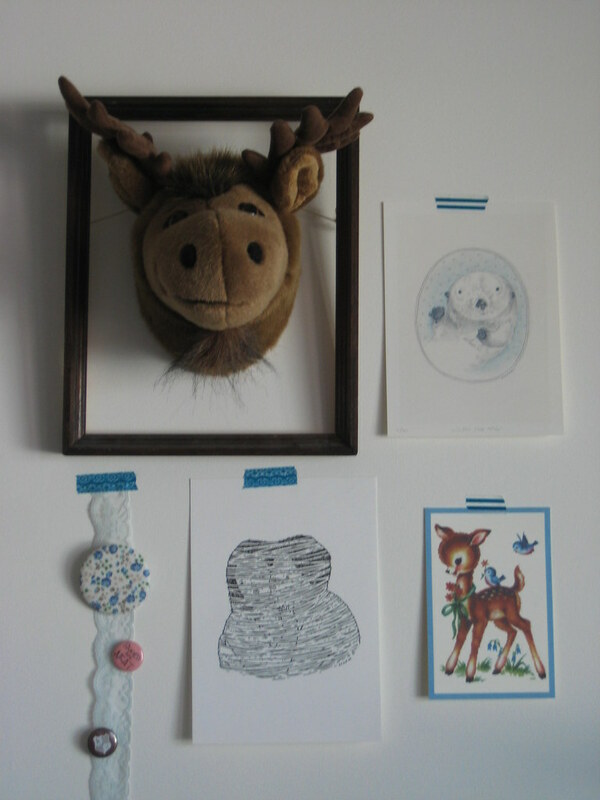 In honour of the Winter Olympics, I used my faux taxidermy moose from Vancouver in an old frame, plus some prints awaiting frames (Winter Sea Otter by Dawn Tan and Webbed by Sean Morris), a postcard from Japan and a few badges, including the big floral one from the lovely Sarah of Sarah's Loft, that she sent me as part of a giveaway prize. Creativo Surface Design is reaching out to textile/surface designers across the globe and we came across your website. We feel that your work would be a great addition to our pool of designs. If you have something under your portfolio, that it is not older than a year, please send us JPEGs in order for us to see and determine if they are a good fit to what our customers are looking for. We are working on Spring-Summer 2011 right now. Just to let you know you, we keep the designer’s names and contact info strictly confidential. So NO worries. In our company we signed a confidentiality agreement so we do not disclose your name and info. Let me know if you are interested in this opportunity. Also, if you know of any other designers that you want to recommend please give them a hint, send us their personal e-mail address and we will keep in touch with them.